Peter O'Sullivan was assessed by a nurse who felt he might of had PTSD. Nurse decided to refer him to psychiatrist but was a 4 month waiting list. Former soldier did not survive until then, falling to his death in Vietnam. A former paratrooper fell to his death from a hotel rooftop while waiting for a psychiatrist to decide whether he was suffering from post traumatic stress disorder, an inquest heard yesterday. 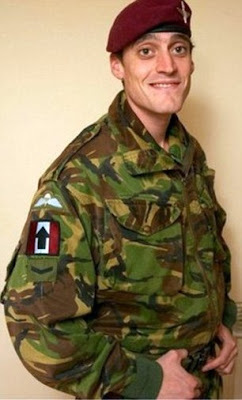 Peter O'Sullivan, who had seen 'very severe military activity' in Afghanistan during ten years in the Parachute Regiment, had been assessed by a mental health nurse from the Combat Stress charity who felt he might have PTSD. The nurse decided to refer him to a consultant psychiatrist - but there was a four month waiting list for an appointment and Mr O'Sullivan did not survive until then. Two months before the appointment he took crystal meth while on holiday in Vietnam and fell to his death from the top of the Liberty Hotel in Ho Ch Minh City on Feb 13th this year, the Gloucester inquest was told. His family, from Stroud, Gloucestershire, are now hoping the authorities will recognise Mr O'Sullivan's death as a direct consequence of PTSD resulting from his service in the elite Pathfinder platoon of the Parachute Regiment.